This past March I was contacted by Silvana Porcu, an English-speaking Sardinian journalist from La Nuova Sardegna. She and her editors were looking for an article on Sardinia but from an outsiders point of view. Silvana found My Sardinian Life and she contacted me. We did the interview via Skype, she in Alghero and I in my adopted hometown in Sardinia. I would like to thank Silvana for taking the time out to interview me on My Sardinian Life. And another huge thanks to La Nuova Sardegna for printing the article. This was a huge honour for me, thank you. What joy and exposure! I’ve already been contacted by a woman who lives in Sardinia and she is Canadian! Imagine! I thought I was the only Canadian on the island. I’m looking forward to meeting these newfound friends. Has anything interesting happened to you because of your blog? Esperta? in uno dei suoi blog, ha menzionato i 10 più importanti eventi in Sardegna, e si è dimenticata dell’unico evento che è può fregiarsi del riconoscimento dell’UNESCO nell’isola, ovvero i CANDELIERI…. ma ha menzionato la sagra delle ciliegie!! Vi sembra proprio che questa blogger possa svelare qualche segreto a qualcuno!! Dai su, diamoci una svegliata, e non facciamoci incantare come sempre dai forestieri… Vediamo di metterci una pezza, e proviamo a raccontarla noi sardi la nostra Sardegna. Roberto ci sono tanti sardi che raccontano la Sardegna, ma ciò non esclude che possa farlo anche uno straniero. Anzi, ben venga chiunque che come Jennifer, innamorata della nostra isola, ne racconti anche gli aspetti meno conosciuti. I will heading to Orosei from July 9 – 16. What do you recommend I do in Orosei (restaurants, beaches, hikes etc..) and what other sites can I drive to? Hello, unfortunately I don’t have any experience in nor around Orosei. Upon my return it will be one of the first areas I head to. Please stop back in after your holiday and offer me some tips. Enjoy your time in Sardinia and be sure to try the seadas and mirto. Please share with me your favorite most beautiful beaches. I am so excited to go to Sardinia.. but I want to see the wonderful areas that touched your soul.. Please share! Hello. I love Isola Rossa and Costa Paradiso. I hope too touch your soul. All the best. Congratulations Jennefer with the interview.I was very nice to know about you.More I read more I know your blog.Happy New Year to you! Great stuff, Jennifer. So glad you found another Canadian ex-pat too! I think that is almost the best part! Congratulations! You are indeed famous 🙂 So happy for you! Thank you, but famous no! Wow that is SO great. Congrats! As my students would say “You’re Famous!”. Nothing exciting has happened to me because of my blog…. yet…. My neighbour told me I was going to be famous, I laughed! You should be thrilled! Excellent article, congratulations Jennifer, keep up the wonderful work. Wow! Way to go Jennifer! It is really wonderful that you and your blog has got such a recognition! Congratulations with the interview, looks nice! Congrats! And that is exciting! 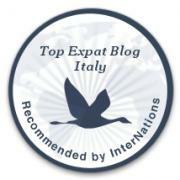 Wow, you deserve the attention for this marvellous blog, expecially for the passion you let feel us! Thank you! Silvana really did a fantastic job, we did do the interview in English! what a lovely feature! congratulations! !